Delicious meats, farm-fresh cheeses and crisp veggies come together to create the perfect quick lunch. Delis have long been the ideal lunch spot across the U.S., and Florida is home to some of the best. Our favorite Florida delis will “wow” you with their choices of warm soups, garden-fresh salads and delicious sandwiches. Here are the 10 best in the state! This local sandwich spot in Orlando is a great place to grab lunch, breakfast or a meal on the go! From the Grateful Bread “Thanksgiving dinner” style sandwich to a classic California Club, there are many choices to fill your stomach at the 903 Mills Market. Dancing Pigs is known to be a “little deli with big flavor!” Whether you’re looking for a Cajun-style muffaletta or their famous Dancing Pig sandwich, you’re sure to find the perfect deli selection to satisfy your hunger here! Before heading to the beach, swing by Sanibel Deli to grab a soup, salad or sandwich for a fun waterside picnic! Top off your meal with one of their sweet homemade ice creams or grab a coffee for a little pick-me-up. If salmon is your thing, the Gravlax sandwich is the perfect choice for you! This kosher deli is one of those spots that locals love. Try any of their breakfast or lunch selections that are served all day. The hearty deli sandwiches, crisp salads and more at this Tampa-based deli will have you craving their dishes every day of the week. Give the Beef Martini sandwich a shot for a unique taste you won’t find anywhere else! St. Augustine’s historic roots bring in many hungry visitors. Before checking out the downtown area, head over to Drake’s for their infamous BLT Tower. You don’t want to miss this fresh and exciting dinning experience. This Gainesville sandwich shop is an affordable and delicious spot many University of Florida students venture to for a quick bite to eat. 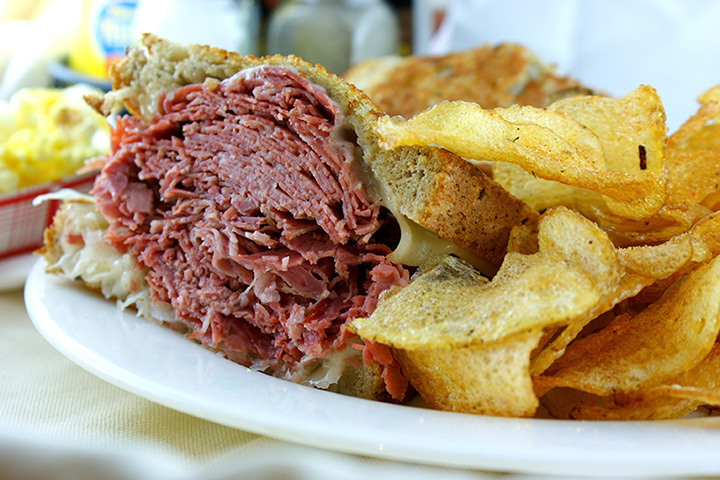 Served on your choice of fresh baked bread, their pastrami and corned beef sandwiches are delectable! Perrotti’s Deli will have you feeling like you’re eating at a famous deli in the heart of The Big Apple! The Grosvenor Square specialty sandwich with hot beef, melted cheddar and fried onions is packed with flavor. Carrollwood’s specialty salads are a great healthy deli option for those who aren’t looking for a sandwich. Pick your favorite salad from their menu and add any of their soups for a tasty and filling combination! For over 60 years this Jacksonville deli has been a neighborhood icon. Pinegrove Market and Deli provides their customers with high-quality Cubans, Italians, Reubens and more! Give one a try for a lunch you’ll want to have again soon.